Mike: I have always been a big fan of leather goods and watches, especially big watches. When I got a Panerai, I realized that straps play an important role with the watch. I started collecting straps and then finally decided to make my own strap creations through numerous trials and experiments. At that point I became a bit obsessed with leather and started a business in 2010. Mike: It really depends on the variant and request for the consumer. All of my straps are done by hand from start to finish including cutting, glueing, drying and stitching. Some of the leather I use need to be cleaned and made ready for the strap making process. Other need to oiled and dried naturally in the sun which takes 2 days alone. Mike: A friend of mine who runs a leather and shoe business gives me a supply of materials in which to make my straps.Sometimes I do the hunting and pick a leather myself when I am traveling to different places. As long as I think a strap can be made I get it. Mike: For me, straps are more of a personalized item that speak about you. I took out all the crazy ideas I had for straps and tried to look at it as a more creative process for creating the straps for individuals. 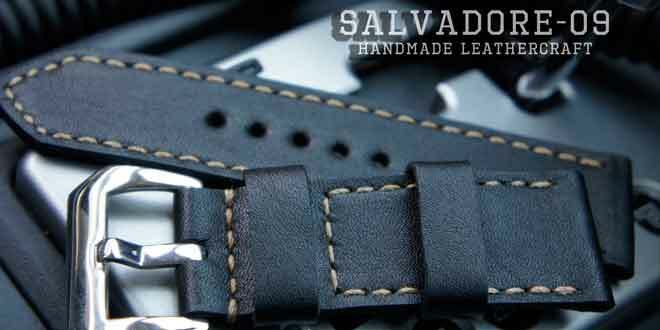 One thing I try an strive myself on is creating a strap that doesn’t imitate other craftsmen’s work. Mike: I personally enjoy collecting straps that are of different colors and shapes. I think that changing the strap really enhances and changes the image of any watch out there. You can easily go from casual, to sport, to vintage, and the back to others with a quick chance of a strap. This at the end of the day will give you a new look and probably keep you from getting bored with the watch. 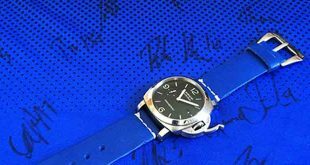 Panerai Central: What can we expect from you in the future? Mike: I am always trying to do my best for my followers and customers. You can definitely expect for me to only get better and better with the quality of straps that I am putting out there for you. I am also doing some top secret experiments to expand the production of other products which will help enhance the look of your watch. Mike: This is one those very had questions to answer. For me I like almost all of the Panerai modes out there. Currently I have a 217 Destro to fulfill my desire of the 1950’s case and I am absolutely in love with the domed sapphire. The others that I would add to the list of my favorites are the 47mm submersibles like the PAM194 or PAM187. Of course the simplicity of the PAM372 or PAM 232 is always nice. Of course I do dream about the the pre-vendome pieces each and every night. Maybe one day! Panerai Central: Have you had any interesting requests when it comes to making straps? Mike: I have received and order that makes me wonder how big the person is because it’s such a super long length. They wanted the strap in a 110/200. Panerai Central: Is there any material you are dying to work with? Mike: I really wanted to make an elephant leather strap because I see a very beautiful texture in the elephant hide. But of course due to the rarity of it and elephants being highly protected I have yet to realize my idea. Panerai Central: So I see you are in Indonesia. How is the watch market out there? Is there a big community as there is in other countries? Mike: Yes, in Indonesia watches have been showing an extraordinary growth. We have a solid community such as Indoristi which is part of the Paneristi following. Having this community gives all of us a different experience with watches and friendships. Panerai Central: Are you watch collector and if so how many pieces do you own and what’s your favorite? Mike: I have been a big fan of watches since I was a kid so i love watches very much but I am not on the level of a collector just yet. Due to a lot of things including financial limitations and several hobbies I have already. I have a small collection and my favorites are the PAM217, PAM390, and AP Diver. Panerai Central: Obviously straps are your main focus but do you want to get into making other things?? Mike:I want to spend some time making some other leather goods such as straps for phone cases, passport cases and other matching leather goods. I feel these are items that you use all the time and would be great to match along with your strap. Mike: I have been to many of the forums and enjoy reading and seeing the pictures of all the watches out there. Honestly I don’t post much because I am not a man who can write the words to express my feelings. So I tend to lurk and read more than I actually post. My first forum I attend is a local one for members here in Indonesia and the seconds one is Paneristi.com where I meet risti’s around the world. I do enjoy reading other forums if I have the time. Mike: Making straps is a very enjoyable hobby for me because I am able to do what I love and make money doing it. Making these straps also allows me to meet a lot of different people with different ideas and tastes. 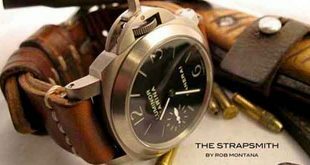 Panerai Central: What helps you come up with the names of your strap styles? Mike: There are no specific guidelines I go by when choosing a name for my straps. I just pick names that I feel are impressive to me when I have finished creating the strap. Some of my straps use code numbers that I get from the type of watches that I use them i n such as the 312, 112, and 390. Panerai Central: Do you make straps for any other watch company or do you specifically make for Panerai? Mike: I make straps for some other watches such as Rolex, U-Boat, Bell&Ross, Omega, Seiko, etc. I can make a strap by request for any watch brand out there if it is requested. Next How to clean your Panerai watch case.